Virtual reality (VR) has been making a splash in psychiatry, and lending credence to an old colloquialism that my cantankerous, Korean-war-vet grandfather always used to drill into my head: Face your fears. Using VR, psychiatrists are empowering patients to confront the sources of their anxieties, all while maintaining their dignity and skirting painful consequences. Recent trials paint a promising picture of this approach: Not only does VR have the potential to help patients with schizophrenia silence the voices in their heads, new evidence shows that it can also help patients overcome their fear of heights with results that are even better than expected from face-to-face therapy. The study, led by Professor Daniel Freeman of the University of Oxford’s Department of Psychiatry, used VR as exposure therapy for 100 patients with a self-reported fear of heights that scored higher than 29 on the Heights Interpretation Questionnaire (HIQ), where higher scores indicated greater fear of heights. 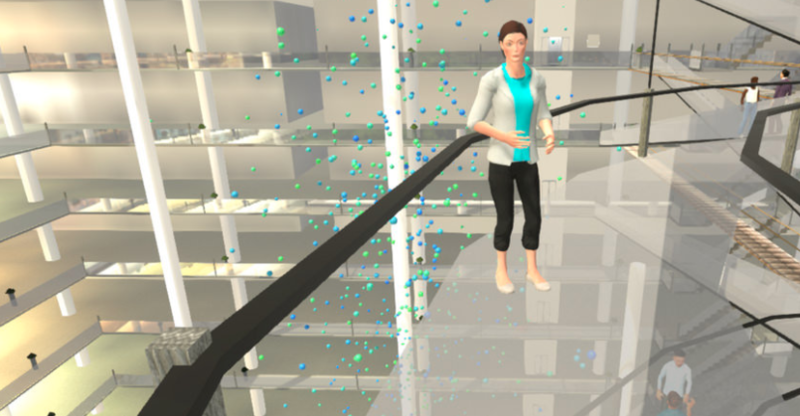 Most patients had been suffering from a fear of heights for about 30 years, but after only 4 weeks of treatment and a mean total treatment time of about 124 minutes, the 49 patients who underwent VR therapy saw mean reductions in HIQ score of -24.5, versus just­ -1.2 in the 51-patient control group. Implications are huge not just for patients suffering from mental illnesses, but for health systems more generally, because VR allows clinics to automate delivery of care. With Oxford’s VR software, patients interact with a virtual coach, rather than a real-life therapist. If scaled up, such treatments could open up access to care for millions more people, Freeman said. While study results were convincing and no adverse events were reported, the trial did present several limitations that must be explored in the future, including that researchers were unaware how representative their participants were of the larger population of people with acrophobia, or fear of heights. 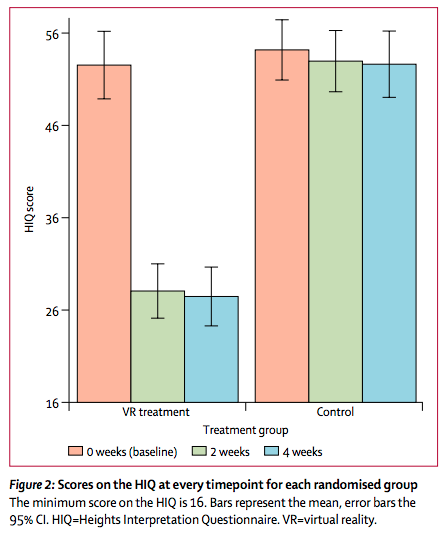 Additionally, follow up testing did not occur at real heights, long-term outcomes were not tested, and researchers are unable to pinpoint which elements of the VR caused the reduction in HIQ scores. Finally, it was unclear whether similar VR therapies could be used to treat other mental health conditions. Following the study, researchers launched Oxford VR, an Oxford University spinoff company whose goal is to “transform mental health for millions,” Freeman said. “We want so many more people to have access to the very best psychological treatment. Therefore, we are developing a large number of automated virtual reality treatments for mental health problems, including depression, anxiety and schizophrenia.” Check out more photos from the fear of heights VR trial here.